Since I'm a web developer, I'm quite familiar with different code editors made for programmers. But, if you are an author, editor or a writer, using a code editor is an overkill. All you need is a minimalistic text editor with almost no bells and whistles. Full-screen editors are quite popular among serious writers nowadays. We're going to look at some of the best full-screen text editors available for professional writers. Some of these are completely free-to-use while others are premium solutions for different platforms. Almost all of the text editors mentioned in this list are simple with no added plugins or extra features. This will help you concentrate on the primary task of writing awesome stuff related to your niche or subject. Let's see the features offered by these flexible and powerful full-screen text editors for writers. 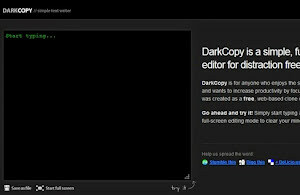 DarkCopy - This lightweight web-based full screen editor is perfect for writers who frequently jot down paragraphs while on the go. It's minimal with no distractions. It works seamlessly within all modern browsers without a glitch. Its one click save feature with automated file naming system lets you easily save your work without any hassle. Since this editor is web-based, you can easily run it on any operating system. Quite similar to most full-screen editing applications, this one also uses a dark theme that's soothing to eyes on every monitor. It saves the file in plain text format without any formatting or special characters. WriteRoom - If you're a Mac user, this premium full screen text editor is made just for you. It has a large user base and includes lots of cool features for the writers. Apart from the ability of change font style and font colors, you can also change the editor background with your desired image. It also includes a feature that lets you configure the key pressing sound to get the typewriting effect for maximum typing pleasure. It's lightweight too with blazing fast editing actions. I generally prefer its dark theme though crisp paper background also rocks with this powerful editor. CreaWriter - This useful full screen editor comes in two different flavors. One is the free version, while an enhanced version can be grabbed after giving a small amount in donation. This editor can save files both in rich text format and plain text format. User can also use background images for this editor. Like other full-screen editors, this flexible editing app also supports configurable keyboard sound. Through hotkeys, you can also insert date and time within this editor. Users can also control the transparency of the editing area window. Q10 - This is my personal favorite and I'm using it on my PC. It's very lightweight and works like charm. You can run it either as a portable application or can do a regular installation. It includes a spell checker for authors. One can easily change the background and font colors. The clicking sound of a classic typewriter elevates the entire writing experience. It also includes session timers which report the amount of content written by you in a given time. You can instruct this editor to autosave your text to prevent accidental loss of your writing. I always keep the portable version of this editor with me to write on the go. It supports several text formatting standards like Markdown. It also supports a wide array of handy keyboard shortcuts to facilitate quick text editing. Like other text editors, this one also supports timers and progress bar. You can also configure various print settings while making hard copies of your text. TextRoom - This is a full screen rich text editor with some very impressive features. You can easily export your documents created through this editor to your Google Docs account. You can also write RTL languages in this editor quite easily. Since it has large numbers of configuration options, you can also find a handy option to restore all the settings to their default state with a single click. You can easily run this editor both on Linux and Windows platform. And its portable version can reside in your pen drive for easy usage on different computer systems. You can also insert images within your RTF documents through this excellent text editor. Ulysses - This premium text editor for Mac users is ideal for professional editors and authors. It has a slick interface with some very intuitive features. Apart from regular text files, you can also export your content as ePub, PDF, RTF or as a standard HTML web page. Writers can also edit files residing externally on Dropbox. It has inbuilt iCloud syncing so that you can access your documents anywhere. You can also add footnotes and annotations within your text to browse and edit it easily at a later stage. File version history ensures you can quickly revert back to old copies, whenever required. OmmWriter - This is yet another premium solution for Mac and PC users who love slick and featured packed full screen text editors. It has dual screen support with custom background images for the editing window. Apart from regular text format, this editor also lets you save your documents in PDF format. Its horizontal cursor matches with the classic text editing screens giving a better typing experience. Inbuilt audio tracks are handpicked by the developers that help you concentrate on the writing job. And last but not the last, like other premium solutions, this editor also lets you customize both fonts and visual appearance of the writing environment with ease.